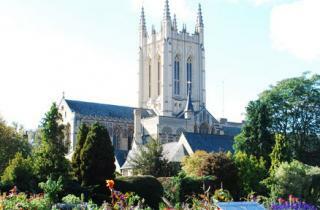 Five people, who have demonstrated exceptional service to St Edmundsbury Cathedral, Bury St Edmunds, will receive the Order of St Edmund on Sunday 22 November. This award is given on or around St Edmund’s Day and is awarded by the Bishop of St Edmundsbury and Ipswich. It was first awarded in 2002 and there are now a total of 15 recipients. Those being honoured this year are John Moore, Paul Deane, Jill Staplehurst, Margaret Ellis and Canon Cedric Catton. All have given service to the Cathedral over many years in a number of roles, covering aspects of the life of the Cathedral including its governance and finances, its work with visitors, its music and worship, maintenance and gardening. The awards will be given during Choral Evensong at 3.30 pm on Sunday 22 November, when new canons of the Cathedral will also be installed.